On Saturday, March 30, 2019 the life of Mother Mary Lou (Reed) Taylor here on earth for 99 years ended as she peacefully slipped away at Generations at McKinley Place. Mary Lou was born on March 15, 1920 in Brownsville, Tennessee. She was one of three children born to the union of Will and Ulcy Reed. Mary Lou was married to John C. Taylor whom preceded her in death. She was also preceded in death by her parents, husband, brothers, Howard Reed and Charlie Reed, Sr.
She confessed hope at an early age and joined New Salem Baptist Church. 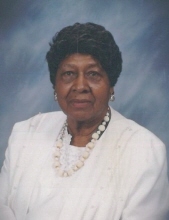 She later moved to Decatur, Illinois and became of member of the Greater Northside Missionary Baptist Church. She loved her church and her church family. She was a mother and grandmother to many. She would often greet her family and friends with a smile, a hug and PEPPERMINTS. Her sweet sharing spirit will never be forgotten. She leaves to cherish her loving memories: one son, David Reed, Sr. of Decatur, Illinois; nephews: YT(Edna) Palmer, Birtis, Rumzy, John Wesley (Cozette), Claiborn (Debra) and Louis T. (Linda) Reed all of Decatur, Illinois, Charlie (Martha) Reed, Jr. of Chicago, IL, Laura (Harry) Waits of Peachtree, GA, Cathy and Dorothy Rivers of Decatur, IL. To send flowers or a remembrance gift to the family of Mary Lou Taylor, please visit our Tribute Store. "Email Address" would like to share the life celebration of Mary Lou Taylor. Click on the "link" to go to share a favorite memory or leave a condolence message for the family.